My family lived in Norton Rd from 1953-62. There were only a dozen or so houses in the street and we were surrounded by fields and lanes which were enjoyed by all the kids in the village. The Coppice coalmine was behind our house and there was a sizeable slag heap which we were forbidden from playing on but did anyway. Our parents were great walkers and we spent many happy summer nights rambling around the lanes picking wild flowers, blackberries and collecting tadpoles which we took home to watch their fascinating transformation into frogs. We also fished in the pond at the end of our road. A train ran through the fields opposite our house, passed through a tunnel and re-emerged from underneath a bridge by the five ways roundabout. My oldest brother, Hubert, and his mates would amuse themselves by sitting on the bridge and dropping onto the open wagons as the train passed through. My other brother, Ray, knocked about with the Williams, the Harris’s and David Lee. At the end of summer the gypsies would arrive and set up camp at the top of the lane. The women and children would go door to door begging for old clothing and toys. My father worked at the Wimblebury coalmine and would come home with a black face which he would rub against mine while I squealed and pretended to be annoyed. Jack Jarvis ran the picture house and we often went there on Saturday night – old Mrs Jarvis would let me in for free. Sometimes the movie would cut out and everyone would yell “Put a shilling in the meter, Jack!” Mr Kelly ran the newsagents and there was a sweet shop and a drapers aswell as fish & chips and a library. 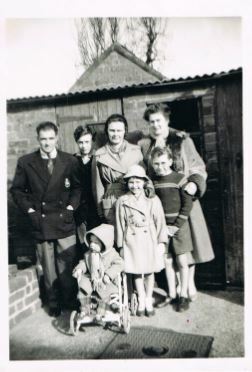 We emigrated to Australia in 1962 before moving on to New Zealand in 1964 but as the years passed my mother would often remark how much she had enjoyed living in Heath Hayes. In the attached photo I am the little girl at the front with my parents, Joe and Daisy behind me. Brother Hubert, (now called Charles) is at the back and brother, Ray is next to me. The other lady and the baby were relatives from New Zealand who stayed with us for 3 months in 1960.